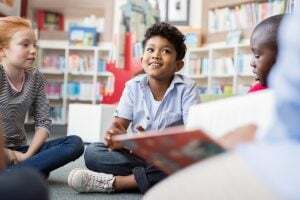 A good library can be a god-send for parents, for not only are there lots of books for your little ones to devour, there are often events, opportunitiesto socialise with other parents and other resources such as toy libraries and audio books. Library Lovers’ Day, 14 February 2019, is the first chance this year for you to celebrate these wonderful institutions and the theme for Library Lovers’ Day 2019 is ‘library love stories.’ There are a range of wonderful ways that you can get involved on the day. Check with your local library to see how they will be celebrating. The ALIA (Australian Library and Information Association) website is encouraging libraries and childcare centres to download their resources to create a shadow puppet play so keep an eye out for a local production. This is just one of the many ways that you and your children can make the most of your library. See below for details on a number of different opportunities throughout the year when you and the kids can get involved. Harmony Day is a day to celebrate Australian multiculturalism, based on the successful integration of migrants into our community. Harmony Day is about inclusiveness, respect and belonging for all Australians, regardless of cultural or linguistic background, united by a set of core Australian values. There are a wide range of events on offer so check them out here. National Simultaneous Storytime (NSS) is held annually by the Australian Library and Information Association (ALIA). Every year a picture book, written and illustrated by an Australian author and illustrator, is read simultaneously in libraries, schools, pre-schools, childcare centres, family homes, bookshops and many other places around the country. Now in its 19th successful year, it is a colourful, vibrant, fun event that aims to promote the value of reading and literacy, using an Australian children’s book that explores age-appropriate themes, and addresses key learning areas of the National Curriculum for Foundation to Year 6. Each year across Australia, the CBCA brings children and books together celebrating CBCA Book Week. During this time schools, libraries, booksellers, authors, illustrators and children celebrate Australian children’s literature and you will often see children’s book character parades and talented librarians creating amazing displays. In September each year stop what you’re doing for one hour and pick up a book. The idea is to encourage Australians to either rediscover or introduce themselves to the benefits of reading. Take the time to learn, grow, escape and relax. In children, reading has been shown to help with identity formation, setting them up for success in the future. In adults, reading has been shown to reduce stress by 68% more than listening to music, going for a walk, or having a cup of tea. Looks like there is always something to celebrate at the library!